Really enjoyed this article from the latest New Yorker: “My Life as an Heiress”. It also helped a great deal that i didn’t pay attention who was the author, so when i got to the last sentence, imagine my surprise! It made the article so much more enjoyable. After seeing the amazing “Birth of Impressionism” exhibit at de Young in July, we’ve been impatiently waiting for the second half: “Van Gogh, Gauguin, Cézanne, and Beyond”. Gui and I went to see it yesterday (a Thursday). And we were disappointed. “Birth of Impressionism” was great because it was so consistently good from beginning to the end, great paintings in every section. Quality of “Van Gogh, Gauguin, Cézanne, and Beyond” was very uneven, it had a few good Van Gogh, Gauguin, Cézanne; basically each artist had its own room, less than 10 from each artist; quantity-wise is far from enough, quality-wise it is not impressive either. And the proportion of paintings in the “Beyond” part was too large–about half of the show, and paintings in the “Beyond” section were uninteresting. My favorite painting from this exhibit is “The Portrait of Gaustav Geoffrey” by Cézanne. WebMuseum has a detailed commentary about this painting, parts of it explained why i liked it so much. It is not a revealing study of the face, but an image of the man of books, the writer among his things. Cézanne often reduces the singularity of human beings; he is most happy with people like his card players, who do not impose themselves, who are perfectly passive or reserved, or immersed in their tasks. The portrait becomes a gigantic still life. The world of objects absorbs the man and lessens the intensity of his person; but it also enlarges him through the rich and multiple surroundings. His repressed activity is transferred to the complicated articulation of his books, the instruments of his profession. Indeed the arrangement of the books behind him, projecting and receding, tilted differently from shelf to shelf and ending in the open volumes below, seems more human than the man, reminding us of a long twisted body in classic counterpoise, like Michelangelo’s Slave in the Louvre, a work that Cézanne admired and drew. I’ve read and re-read Irving Stone’s Lust for Life, which used to be one of my favorite biographies. I’ve cried so hard during each read. Despite Stone’s fictionalizing of Van Gogh’s life, the book gave one a vivid image of the artist and its inspiration, as well as all the backstories of each of his painting. I remember the famous yellow room was painted in anticipation of Gauguin’s visit, and it was used to decorate the room. While visiting Italy last fall, I finished reading Moon and Six Pence on my iphone. Even though i was never crazy about Gauguin’s paintings, the book painted a good portrait of the artist, and gave a complete overview of his life. I fell in love with impressionism after my first European trip in 1997. I feverishly read on the period history, and browsed through every artist in this category at WebMuseum. At that time, one of my favorites was Cézanne. I search high and lo for his paintings on line, downloaded them and made them into my screen saver. I used to sit in front of my computer and watch the slide show over and over, mesmerized. I never thought i would love a still life till i saw those done by Cézanne. Naturally i felt cheated when there were only two still life by Cézanne at de Young this time. What a let down! Friend Bonnie got a moth orchid for her office desk. After the bloom was gone, a keiki developed on the flower stem! it was fascinating. I’ve never seen a live keiki before. Then the keiki started to grow roots. New leaves and new roots were growing left and right, but no more flower. Right before my maternity leave, our department was due for another move. 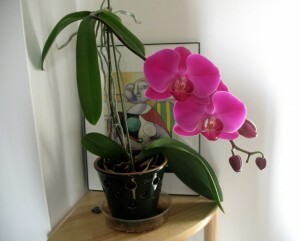 On packing day, Bonnie said she wanted to throw away her orchid since it didn’t look like it would bloom anytime soon. She was tired of carrying it around. I jumped, “I will take it! With all that healthy leaves and roots, all it needs is a little sunlight, then it would bloom.” I told her that she could have it back once the flower shows up. The new flower stem grow out of the keiki this time. I think it was around the time when Noah was born. I’ve forgotten what the bloom was like. So we waited. And here it is. Exactly like my first orchid, which i’ve managed to kill while we were on Cole street. Some kind of reincarnation, maybe?